With the vampire popularity still on the rise the people in the entertainment world are coming out with as many vampire books, movies and shows as they can for us bloodthirsty fans. If you thought True Blood and The Vampire Diaries were the only shows we were getting you were mistaken. It appears that a new vampire show is coming to a TV near you, The Fixer. The Fixer is based on the Lawson Vampire novels by Jon F. Merz (looks like all vampire books are getting their own show or movie these days). âAbout Lawson’s World: Called “James Bond with fangs,” THE FIXER tells the story of Lawson, a cynical, jaded part cop/spy/commando divinely chosen from birth to help protect the Balance – the line separating humanity and the race of living vampires that has evolved in secret alongside humans over thousands of years. Called upon to protect his race by rooting out rogues, criminals, terrorists, and ne’er-do-wells, Lawson dispenses justice with extreme prejudice, sarcasm by the bowlful, and bullets by the pound. Lawson’s area of operations (AO) is Boston and New England, but his previous missions have taken him all over the world. What makes THE FIXER so unique and utterly cool? Unlike every other vampire story, the vampires in Lawson’s world are *not* undead. They’re members of a separately evolving race that has existed in secret for thousands of years. They have their own society carefully intermingled with humans who, for the most part, have no idea they exist. Sounds like an action packed kind of show fit for anyone that loves guns, fighting, badass espionage and the supernatural. Check out the teaser trailer below, or head over to The Fixerâs official website here. 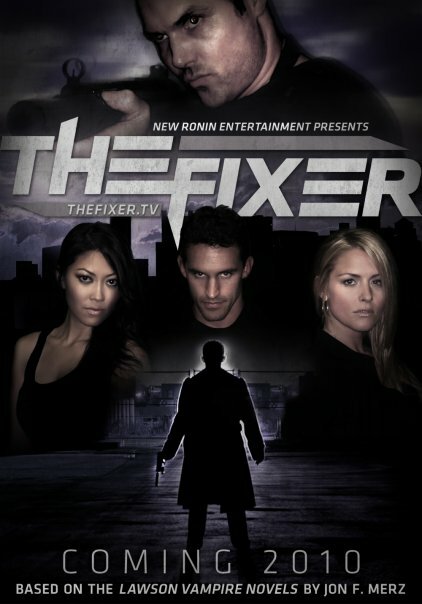 The Fixer – Teaser 1 from New Ronin Entertainment on Vimeo.